Automatic call distribution is the practice of directing incoming phone calls to available agents. This is handled by an Automated Call Distributor (ACD) which can be a software or hardware based solution. By integrating with other available systems, an ACD can include a range of data in its decision making. For example, a customer may need to proceed through an Interactive Voice Response (IVR) system before their call is directed. 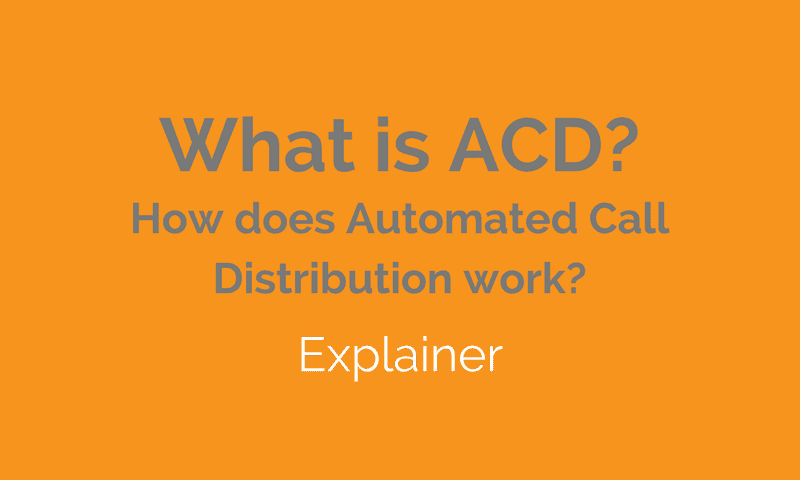 The ACD can then factor in data received from the IVR, using it to inform call routing. The original ACD systems were devised to complement or replace live switchboard operators, in response to a substantial increase in telephone communication. Early ACDs were limited. Although able to handle dramatically higher volume than human operators, they could generally route calls based only on agent availability. Over time, the kinds of decisions an ACD can make have grown more sophisticated. This is largely due to increased Computer Telephony Integration (CTI) that enables a large number of systems to supply data to the ACD. One of the most important developments in call distribution is conditional routing. Conditional routing subjects contacts to a series of if/then scenarios, which impact the destination of the call. For example, ACD routing behaviour might include the rule if caller is VIP then route to next available agent. Obviously, rules can potentially contain a much greater degree of complexity than this example. However, contact centers typically find that the kind of sophisticated conditions they need are not cost-effective given the expense of implementation when using traditional call center infrastructure. The reason is generally the difficulty of integrating other data sources with the ACD, and the problems of regularly changing the associated setup. Nonetheless, conditional routing is very important in contact centers operating at any significant scale or across several sites. The ability to react in real-time to current or anticipated call volume allows for more effective load-balancing across resources, and better use of overflow capacity. if skill X is required, then route to agent with skill X. The kind of skills that a contact center bases its routing behaviours on really depends on the kind of contacts it receives. They often include broad categories like ‘sales’, more specialist areas like ‘escalated complaints’, or core skills such as the preferred language of the customer. Skills-based routing helps both customers and the contact center by linking callers to the agents who are best positioned to help them. In turn, this benefits some of the key contact center and customer experience metrics, such as number of transfers, First Contact Resolution (FCR), and Average Handling Time (AHT). Skills-based routing is also useful for training new agents. Given the option to route challenging calls to experienced call handlers, businesses can ensure trainees practice with simpler situations. As we have discussed previously, the phrase ‘Automatic Call Distributor’, referring to a special component, is somewhat outmoded in the modern context. This is partly because only the smallest call handling task – something on the scale of a receptionist desk – could consider distributing calls manually. So, the vast majority of calls to businesses are routed “automatically” anyway. In a fully integrated contact center the mechanism for call distribution hardly needs to be thought of as a separate entity anyway. A versatile call center platform performs a number of tasks including recording interaction data, managing queues, and distributing calls. In fact, ACD is now more like a specific instance of Automated Task Distribution. This is sometimes referred to as Multichannel ACD, which is a confusing name considering that the ‘C’ for ‘Call’ contradicts the multichannel part. But ignoring the naming, the purpose is clear. In this broader context, the problem to solve is how to automatically give a “task” to an employee. The task could be an incoming email, an incoming query, ticket or case, or a scheduled request for a call. It could also be a task to verify and enrich the data associated with a contact, a case, a lead, or an account. Or, it could be routing an inbound call to an employee, i.e. the real-time call distribution case we’ve been discussing in this article. Problems mainly arise for businesses when their call platforms are not deeply integrated with surrounding systems, and when effecting change in routing behaviours is highly laborious. In the first case, a lack of integration between data sources leads to unnecessary contact attempts, duplication of effort and inefficiency in all the processes around the call distribution mechanism. We commonly see this in situations where important central resources like CRM do not communicate with the ACD. Customers must repeat information, or even direct the first agent they reach regarding how to help them. In the second case, the complexity of platform elements means sizable IT projects are needed for even the simplest changes. The bar for reasonable change is set very high when this is the case, and senior contact center staff are unable to (affordably) address the problems they encounter on a daily basis. This is why it’s so important to select an approach to call infrastructure and integration that meets modern continuous change processes.